This is my latest release and is the fifth fantasy story I’ve had published and is sort of the fifth tale in my Ethanar series. I say sort of because it’s a loose series. All the stories are separate characters and so far separate places but they do build up the world collectively and I will have some of the people and places appearing in the epic novels set in the same world so it’s worth reading these and getting a taste for the coming full length fantasy novels. 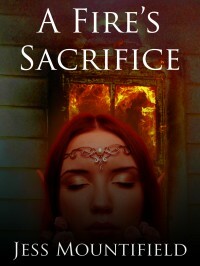 A Fire’s Sacrifice has it’s own shiny page and blurb and all that for those curious about this story, but to add to that, it’s a bit of a mash up between period, domestic slavery, class friction and fantasy all melded into one. You can buy it already at the bargain price of $1.99 0r £1.43 from any of the amazon stores, but for speed Amazon.com, and Amazon.co.uk. I’m also throwing a mini launch party on facebook for anyone who would like to come join in. There will be the chance to win several of my eBooks and probably other things to boot. Quite excitingly this is my tenth published story in my ninth publication under my own personal name and completes the set of tales I’ll be packaging together with more information on the Ethanar world early next year. I review rather a lot of books and I’ve had quite a number of requests from people over the years in differing places and ways. I’ve also sent quite a number to other bloggers and readers in various locations, so I admit this is a bit of a rant about all things book review. Most authors know that book reviews that are favourable help them sell books, sometimes even unfavourable reviews will help sell some copies but I’ll get to that in the second half of this blog. Most reviewers also know this and are reviewing to either try and help authors or because they think they’re opinions are something the world wants to hear through varying degrees of arrogance (The vast majority of reviewers aren’t arrogant about this but there are some, again I’ll get to that later). So authors, you can help yourselves in various ways. Most reviewers, including me, get far too many book requests than we could physically ever do even if we read constantly for the rest of our lives. As such, we sometimes have to say no. When we do, please be respectful. It just means we didn’t choose your book. Often it’s because your book isn’t one we think we’ll like. If we do review your book and say something negative about it, don’t go on a hate fest, you only make yourself look bad and make the reviewer wish they’d not bothered. Putting reivwers off reviewing hurts everyone. Almost every reviewer will post some basic guidelines for what they want and how they want it. Follow this to the letter. I reject 95% of my review requests because they don’t follow the guidelines I’ve laid out in the places I accept requests. That’s 95% of authors who can’t read! In these cases, I don’t even bother to read the email to see whether I like the book or not, I just flat out reject and I send a copied and pasted form response which lists the reasons I might have rejected the request. My msot common reason is the lack of personalisation. I reject a request if the author has copied and pasted whatever they sent the last person without bothering to try and find my name. I usually make my name really obvious so I consider being unable to find it no excuse. The three other big reasons I reject books are all down to not meeting the guidelines, most notably, the wrong subject line. I like the subject line to include two phrases to make them easy to find and keep track of. Review Request and the Book Title. I need Review Request for my organisation of the emails and the book title helps me find the email again with a quick phrase search to let you know when I’ve reviewed the book. Also the book being in a genre I don’t except. This happens way more than it ought to. If I say I accept a list of genres and only those genres I’m not likely to read anything else. I’ve got to cut the list of possible books down somehow, so sending me a book from another genre is a waste of everyone’s time. Finally I reject a lot of requests because they’ve not included the rest of the information I want. I like to have a sample, the blurb and the cover. The cover so I can upload to goodreads if I need to and put it in the review blog when done, and the sample and blurb so I can get a better feel for the book. Sometimes I get the blurb and no sample and have to go hunting for the book to find out if it’s in third person or first person present or a myriad of different possibilities. There are a few styles I don’t like so I won’t ever accept a book without reading the sample first. even worse is when there’s no blurb and no sample, just a title. There are several ways you can help your reviewer and free up their time to help more people. Making sure they have every link they might need to make up their minds in the first place is a good idea. Some reviewers like it if you send them the book in the first email so they don’t have to go back and forth but I don’t. A whole book is bulky and I find it a little presumptious, but I like to have links to the book on Amazon, especially if there’s some reviews already there. Some good reviews might sway me. Lots of bad reviews that seem mean often make me pick up a book and so does no reviews. I like helping people. Also, if you must send someone a pdf rather than mobi or epub version of your book, try to do an A5 pdf rather than A4 pdf. Nothing annoys me more than trying to read an A4 sized page on my kindle screen. It slows me down and makes me annoyed at the book, which isn’t good for the review. Unfortunately, we get inundated with books and find it difficult to get through them all in a timely fashion. Sometimes real life crops up etc. I keep all my books on a list over on goodreads and many other reviewers do similar so people can keep track of me without needing to constantly bug me for due dates. I also don’t email out when the review is done. I expect you to keep track of that yourselves, especially seeing as I provide a link to my lists where you can see when the book has been read by me and whether it’s gone off my to-review list or not. If you can be proactive about finding the review yourself and keeping track of where you are in the queue, we don’t have to use up time telling you. I actually find it easier to pick up the next review book and start the process all over again when I’ve had a thank you or an equally nice conversation with someone I’ve reviewed. When someone thanks me for my time, and is eager to let other people know about the review I get hits, tweets and facebook posts which give me more of a platform to help more authors in the future. I like helping people so you can help me do that more. As you can see from my progress bars on the right, I’ve got a project on there with the above title. This was one of those ideas where I had the idea, got really excited and pretty much had to write it straight away and it totally hi-jacked NaNoWriMo so I thought I’d share an excerpt from the start of it. It also spawned a whole series of stories and this isn’t actually the first of them I don’t think but it’s still awesome. “All right, all right, the lot of you can have an hour in the market. Then I want you back to your stations.” The man said with an Irish lilt to his voice and chuckled. The five people Auraylia had seen badger him for the last few minutes grinned and dispersed into the crowds. Despite knowing none of them she found herself smiling at their exchange. He wore the uniform of a Unified Federations ship captain and the deep blue shirt and trousers brought out the blue in his eyes. Complete with the black ankle length coat and insignia on the right shoulder he had many young ladies turning their heads in his direction, hers included. She saw him pull out an ornate pocket watch and glance at the time before making his own way into the market area right past her. The scent of spiced aftershave marked his path and tantalised her senses. Intrigued, she followed him. For several minutes he merely browsed and didn’t buy a single item but eventually he haggled for a small packet of herbs from a specialist stall. It disappeared somewhere into his coat, leaving her no reason to approach him yet. She kept back and continued to watch, only half sure she wanted to approach but convinced the risk would be worth the nerves making her shiver already. Dylan made his way through the pressing crowds, inspecting the wares of many of the market stalls. Although he’d held out on his crew and pretended to be concerned over their wishes to explore the market town he was pleased at their desire. It gave him the free time to browse alone and gather his thoughts. The few purchases he had already were tucked into the deep pockets of his coat and weighed it down a little more than usual, but it helped keep them safe from the little hands that snuck about the place. As he glanced over some ornate necklaces on one stall and wondered if they would make a good gift for his third officer he noticed a familiar face amongst the masses. A young woman, barely of age and dressed in the usual female slave outfit, a pale coloured top and pantaloons, leaving her mid-riff and arms bare with organza overlays and shoulders to hint at the body that lay beneath. Unlike most of the girls nearby who wore oranges and yellows to stand out she wore a pale blue ensemble. In contrast it made her easier to spot and it was the third time he’d noticed her meandering along behind him. He frowned but didn’t confront her yet. So far she had kept her distance and appeared to be alone. At the next few stalls he picked up more of the items he wanted, including the necklace he’d spotted and two more books for his miniature library in his cabin. With the bottle of wine, and jars of his favourite foods he had his arms full and started looking around for something to carry his purchases in. The slave girl chose this moment to close the final gap between them and he steeled himself to reprimand her or prevent her stealing his items. “Can I help with those, sir?” She turned her bright green eyes on him and they flitted across his face like a nervous cat’s. Her words startled him to silence and for a moment he could only stare back at her. Before long she broke the contact and lowered her head, allowing him to think about the question she asked. “How do I know you won’t run off with anything I hand you?” he asked. She pulled back the organza sleeves that covered her wrists and most of her hands and showed him the black rose tattoo on the soft inside. He frowned, such a tattoo in so delicate a place must have hurt. “My master and owner trades under this mark. If I displease anyone they can find him easily in the nearby district.” She pointed to the buildings rising up in the west. Several tall wooden houses rose up each with a different symbol on the side of it. The matching black flower covered one of the constructions although, like many of the others, it looked as if it had seen better days. When he looked back at her she was shivering on the spot and her head was bowed. He couldn’t tell if it was respect or fear but he decided to take pity on her. “How much will such a service cost me?” he asked. Her head lifted and showed him her widened eyes. She nodded and flicked her brown hair back behind her shoulders so it wouldn’t become entangled before taking the few parcels he sent her way and cradling them against her own body. “You’ve been following me for quite a while,” he added as he made his way to the next stall of interest to him. She had the good grace to blush at this challenge but didn’t respond at first, giving him time to purchase some food for the fish he kept. The wrapped up item was added to the stack already burdening her. “I saw you earlier, sir, with your crew. I liked the way you talked to them. I can tell you are a good man,” she said as he moved on again. “It’s large, and empty. Some say it is beautiful but its charm soon wears off,” he replied, starting to get a sense of where this conversation was going. Despite her sweetness she wasn’t very subtle. He stopped walking and gave her his full attention. For a moment she met his gaze again but she soon lowered her eyes to focus on his booted feet. “I understand.” She turned her face back to him and he could see the tears threatening to fall from her green eyes. Such a reaction was unexpected. “What do you do for your owner when you’re not helping Captains with their shopping?” He carried on with his browsing and tried not to dwell on her emotions. He stopped their conversation to purchase his final item, a bottle of strong single malt whiskey, a special crew member who’d never had a present appreciated a good drink. Once it was wrapped and in the slaves arms she carried on her list of tasks. She stopped talking and followed on and he figured the list was finally complete. It wasn’t what he’d expected. Most of the slaves here were for companionship or other relational services but she seemed to have genuine intelligence and skills. It occurred to him that as a free person she’d have made a good addition to his crew. He raised his eyebrows and she noticed. As she finished speaking they reached the edge of the market and the transport from his ship. She helped him load the packages in the cargo space inside and smiled at him. “I’m really sorry I can’t buy you. As a Unified Federations Captain Its just not something I can do. Slaves aren’t allowed on our ships, but I’m sure someone will come along who can,” he said as he placed a small note into her hand and kissed the back of it. She smiled and thanked him but he could see the disappointment in her eyes. He had to push it from his mind as he glanced at the time and saw he only had five minutes to present himself to the Federations building, and the admiral residing there, for his next mission. His ship had docked earlier than expected so he’d had time to use up, but he hurried the small hovering transport along to the only building in the area that looked well kept. It was also the only one made of materials other than wood, and the brick and stone stood out for him to travel towards. On this planet there were few other vehicles but some moved back and forth on the hyper-way, most of them going in between the Federations buildings and the houses of the more wealthy residents. This planet didn’t look like it had been colonised for over fifty years, but other than the working class farmers, slave owners and other various officials stationed here, the rainy climate hadn’t attracted many people and the indoor market was one of few tourist attractions for off-world visitors. He rushed up the steps and through the archway to stand in the atrium of the building and a receptionist greeted him before he could look around. A minute later he was shown into the commanding officer’s room. A balding man sat behind a desk with a built in display. When Dylan walked in it had a map of the nearby star systems, with enemy territory in red and their own in blue. The map had a lot of red on it. “Ah, Captain Gray, come in, sit down,” the commander waved his wrinkled hand towards the chair nearest to him. Dylan did as he was told. Until now all his orders had come from his previous captain, the now Admiral Keane. Before him sat someone who’d been an admiral for over ten years and probably didn’t hold out much hope to be promoted further. The admiral didn’t reply but motioned towards the map. On the other side of all the red was a blue blob that spread around one solar system and towards the left edge. Somewhere off the map he knew it connected up. The admiral stood up again and Dylan had to hurry to his feet. For an old man he could move faster than Dylan expected. The two transports joined the hyper-way back to the docks and his ship. Long before they got there Dylan could see the container of cargo sitting right by the main hold of his ship. Beside it was his logistics officer already overseeing the loading of the food and other resources his crew would need to replenish their mandatory stores. As soon as the admiral got out the transport and walked over with him he noticed a group of slaves there to help with the transfer process. Walking out of the loading hatch came the same slave girl again. She gave commands to several of the men around her in a language he didn’t understand, and they lugged the boxes and crates wherever she directed. Not wanting her to notice him he led the admiral into the ship while she was in the container and they went up to the main ship where they could observe the progress without being directly involved. After making polite small talk the admiral handed Dylan the electronic tablet with his official orders on as well as a list of all the cargo he was loading and where it needed to go. “Did you also get my request for extra crew?” Dylan asked before the admiral could leave. Dylan nodded. Admiral Keane had said similar words last time they’d seen each other. “I hear you picked up some crew on your last couple of missions? A Thorian as well?” the admiral continued. “I did. All of which are now working on the Sapphira in my service. And on that note, do you see that girl down there?” Dylan pointed at the slave he’d met an hour earlier. The admiral looked her over as she helped his logistics officer work out where the cargo should be stowed. “No slaves are allowed on a fleet ship. You would have to declare her free, but if you think she would help.” The admiral took another look at her as she issued more orders to the men helping with her. Dylan knew this wasn’t the normal way to acquire crew but so far every new recruit had been found in some new way. Buying a slave was possibly one of the simplest. The meaning wasn’t lost on him. There would be no refund if she proved to be a reliable member of his crew. All he might get is gratitude, and a little recognition, but the money would be gone. He also suspected the admiral thought he had further ideas about the pretty girl but that line of thought was nothing new from men like the admiral. With the important hand overs done Dylan escorted his superior back to his transport and went back to see his logistics officer, another of his new recruits. She smiled when she saw him. “I’m thinking of hiring her,” he said, not mentioning her current slave status. “A brilliant idea, captain.” The enthusiastic crew member beamed and bounced on the spot, as she often did when she was excited. With the extra boost of confidence from one of his own trusted crew Dylan’s uneasiness at buying the slave reduced enough for him to act, and he hurried over to her before she could leave. “Hello, sir,” she said to cover her surprise. Again her head bobbed up and down vigorously. “Well, my highest offer so far was nine hundred credits, but I’m advertised at fifteen hundred.” Dylan winced at her words. The price was significantly higher than he’d expected when she’d said she was cheap. Her beauty must play a large part in her cost and if he paid her asking price it would almost entirely wipe out his savings. At his hesitation she lowered her eyes again. “It’s too much isn’t it?” she said, barely loud enough for him to hear. Instantly her head bobbed back up again, another gleam of hope on her face.